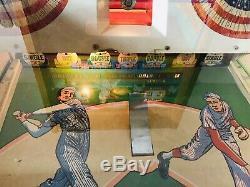 Vintage Williams Grand Slam Pitch & Bat Baseball arcade Pinball game, Machine. 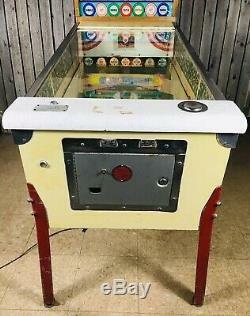 Game powers on and was working properly until we moved it, Balls are stuck and it just keeps trying to cycle. 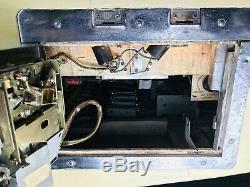 We were told by our coin op guy its an easy fix just have not had time to take it to them to get fixed. Not sure if its the original glass. Glass appears to be about 1 inch short, not sure if its supposed to have a spacer or if its just replacement glass. 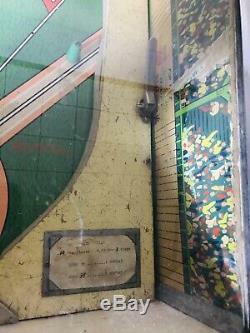 The wood part at the top inside got chipped from play and the graphics on inside panels have some paper loss. Please look very closely at the photos for a better description. 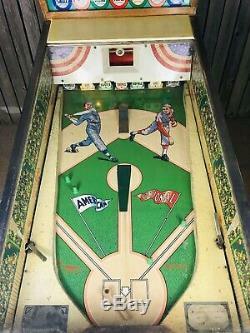 It is the very popular Williams Grand Slam Game that features Two players can play in competition. 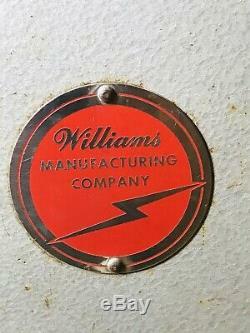 It pitches three different balls (Fast, Curve, Knuckler)that is pitched to you by a mixer unit. You never know what is coming. 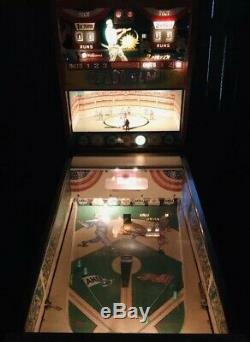 It allows you a extra inning if replay or one of the many specials are accomplished. Very fun game to play by yourself or with a friend. 67" long x 69" tall (at the tallest point). PLEASE SEE PHOTOS FOR MORE DETAILS AS THESE ARE PART OF THE DESCRIPTION. 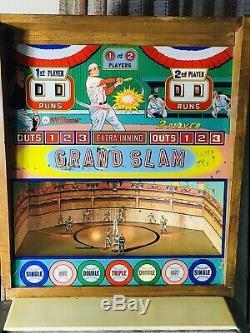 The item "Vintage Williams Grand Slam Pitch & Bat Baseball arcade Pinball game, Machine" is in sale since Friday, March 15, 2019. 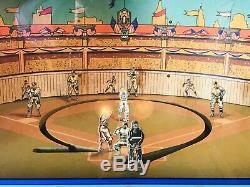 This item is in the category "Collectibles\Arcade, Jukeboxes & Pinball\Pinball\Merchandise & Memorabilia". 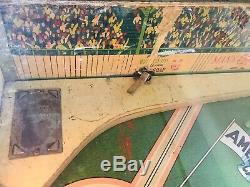 The seller is "724football1234" and is located in Pittsburgh, Pennsylvania. This item can't be shipped, the buyer must pick up the item.